Get some hands-on experience with preservation at our workshops, or take a garden tour. See a calendar, and register online here. Continue to be vigilant in checking for ticks. Think beyond the stingers! 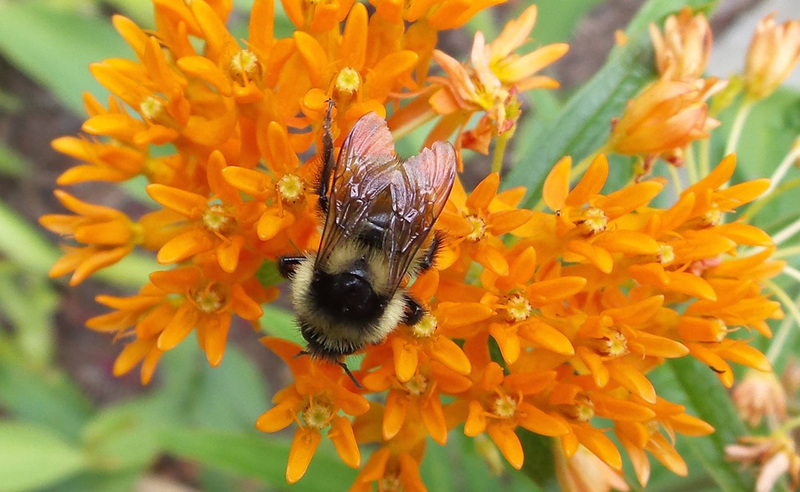 Appreciate the diversity of pollinators in your landscape. Be sure to wash produce from your garden or the farmers’ market well. Bulletin #4336, Best Ways to Wash Fruits and Vegetables will show you how. Research the Master Gardener Volunteers program so you are ready to apply in the fall! Learn how to manage Japanese beetles in your garden. Plant crops for fall harvest. Spinach, lettuce, kale and other cole crops do well with shorter day lengths. Fill in your empty spots by direct seeding greens and transplanting broccoli, cauliflower and cabbage now. Try this handy chart for sowing at the right times throughout the growing season. Establish or renovate your lawn. Have some trouble spots or interested in reseeding your entire lawn? Mid-August through September is the best time of year to establish new grass. Check out Bulletin #2367, Establishing a Home Lawn in Maine, Bulletin #2243, Maintaining a Home Lawn in Maine and Bulletin #2166, Steps to a Low-Input, Healthy Lawn for tips and step-by-step instructions. Begin preparing new garden sites for next year. Thinking about where to establish blueberries in 2016? Check out our video on site selection. 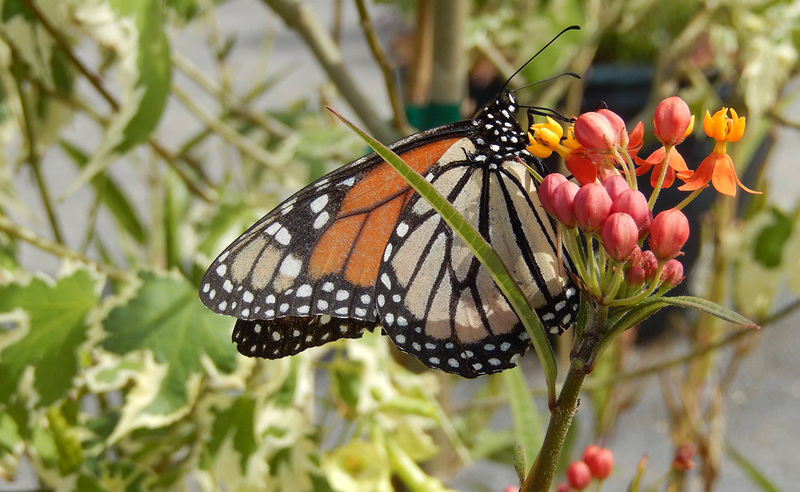 It’s never too early to cultivate kids’ interest in gardening and the natural world. At Edgecomb Eddy School, second-graders are growing their own food. 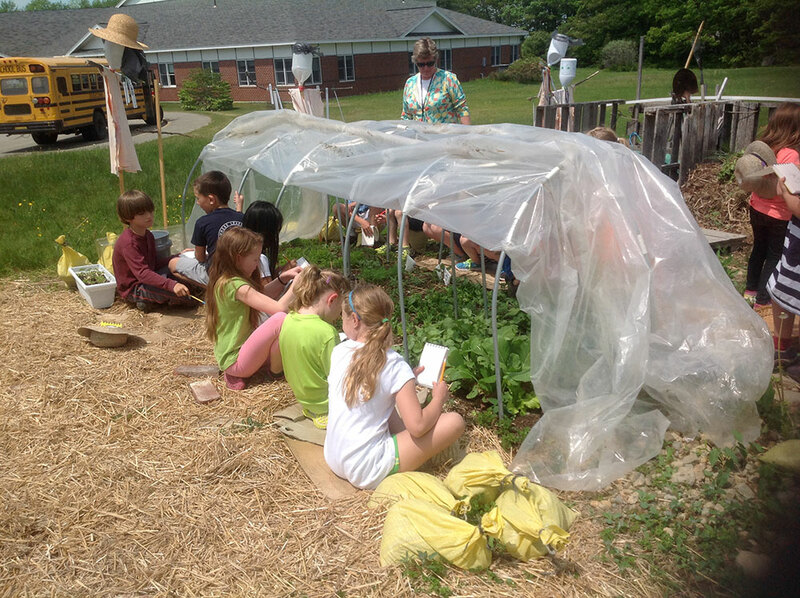 Thanks to Becky Benton, a UMaine Extension Master Gardener Volunteer, and second-grade teacher Dawn Garey, the students are immersed in gardening for an hour every week. At least some of that time is spent digging, planting, weeding, and harvesting a 30 x 30 garden on the property of the Edgecomb primary school. “During the school year, we have a small window of time when we can work directly in the garden,” says Benton. So this year, as soon as the snow receded, students planted vegetable seeds under a hoop house that Benton constructed. Later in the spring, they harvested salad greens, spinach, dill, and radishes and made a big salad to share among themselves. They also shared their produce with other students through the school cafeteria’s salad bar. “It’s so exciting to see the second-graders raise food and share it with the rest of the school,” says Benton. Last October, the students planted six varieties of garlic, and they were very excited to see it come up in the spring. In February, the students went snowshoeing in the garden; they measured the depth of the snow and discussed what they thought the garlic was doing under all that snow. That same month, they planted scarlet runner beans indoors in recycled two-liter soda bottles with cotton cord to wick the water through the soil. The beans were trellised up to the ceiling in the classroom on garden twine, and by early June, had been blooming for several weeks. Before school ended, the students transplanted them into the garden outside. Each student also made his or her own “garden kid”: scarecrows decorating with recycled T-shirts and plastic blind strips. The students wrote garden poems and sayings and attached them to the arms of their garden kids. This year, 16 garden kids — one for each second-grade student — grace the Edgecomb school’s garden. 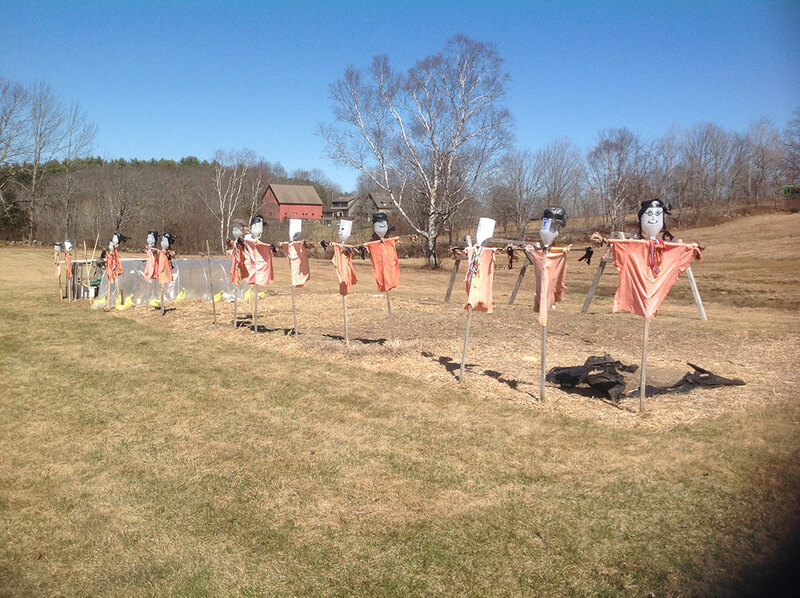 Those driving by on Route 27 can see the colorful “kids” in the distance. These second graders keep garden journals, and with the help of Benton and Garey, they also try a lot of experiments. Naturally, some of those fail. “Kids need to understand that they can’t always have instant gratification,” says Benton. This year, for example, the composting experiment, where kids save and compost scraps from the school cafeteria, didn’t go so well, especially because of the snow cover and long winter. Between preparing lessons, gathering supplies, and working outside with the kids for an hour and a half, Benton spends at least eight hours a week on the project. And because she doesn’t receive grant funding, she often purchases supplies for projects on her own. “Teachers put their own money into a lot of things, too,” she says. Karen Kleinkopf, a Master Gardener Volunteer and the co-founder of F.A.R.M.S. (Focus on Agriculture in Rural Maine Schools) worked with Benton and Garey two years ago, doing taste tests in the garden. “What Becky is doing is amazing. If every school could employ a farm-to-school educator, we would have healthier communities,” says Kleinkopf. FARMS offers nutrition and cooking classes to people of all ages in their community kitchen. The work done there, along with the work Becky Benton and teacher Dawn Garey are doing in the school garden complement each other. This past year, for example, Edgecomb school kindergartners made a field trip to FARMS’ community kitchen in Damariscotta for a hands-on cooking class. 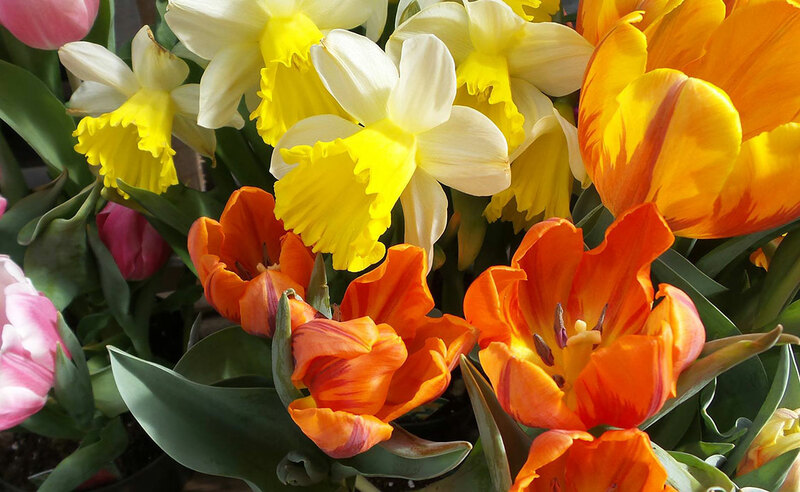 Carol Gardner is a professional writer who took the Master Gardener Volunteer program in 2013. 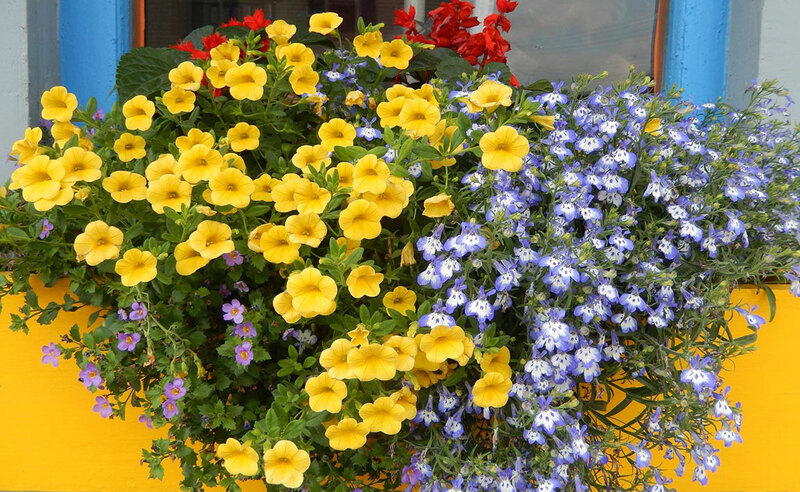 Note: This article addresses how to grow landscape plants in clay soil. To learn the basics of clay soil management in the vegetable garden, see “Growing Vegetables in Clay Soil” in the June 2015 issue of this newsletter. 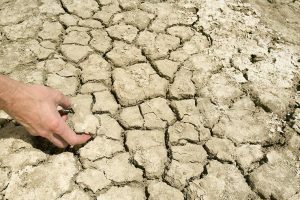 How can I tell if I have clay soil? A quick and easy test can reveal the answer. Scrape away the plant material and mulch from your soil, and remove enough topsoil to form a 1-inch ball. Put the soil in the palm of one hand, and add several drops of water, kneading it into an evenly moist ball. Bend your index finger into a curve, and hold the soil ball in the curve. Then, push your thumb across the top of the ball to “push out” a ribbon of soil over the top of your index finger. A coarse sandy soil will crumble before forming a ribbon. 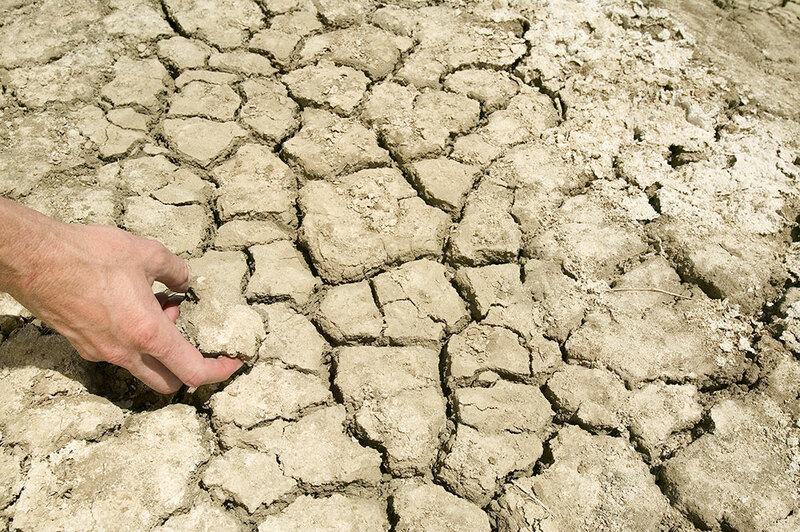 A soil with low clay content will break from its own weight before it reaches an inch in length. That type of soil is probably a sandy-loam or similar soil. 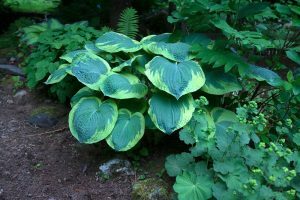 It is well-drained, but may not hold nutrients well, and it probably requires frequent irrigation in the middle of summer. If your soil ribbon extends 1-2 inches before breaking, it’s probably a clay loam, which holds considerably more nutrients. It can be a very productive gardening soil. If your soil ribbon extends two inches before breaking, you have a clay soil. A soil with more than about 40% clay by volume is called a clay soil. Is clay a “bad soil”? What problems does clay present in the landscape? Clay has excellent ability to hold nutrients for plant use. It does not erode as readily as sandy soils. However, the fact that clay particles are very small means that the pore spaces that separate the particles are also very small. Water fills those pore spaces, and is held strongly against gravity, which is the force that causes water to drain downward through soil. This reduced water drainage means there is often very little air (including oxygen) in the pores. Because roots need both water and oxygen, and because roots need space to grow, they do not develop as well in clay soils as in soils such as loams, which have both large and small pore spaces. Can I improve the clay soil in my landscape? If so, how? There is another solution to the problem however, and it is much easier: accept the clay soil and choose plants that are adapted to it. What landscape plants perform well in clay soils? Evergreen trees: balsam fir (N), Norway spruce, black hills spruce, Austrian pine, Scots pine. Shade trees: red maple (N), silver maple (N), river birch, common hackberry, green ash (N), honeylocust, Kentucky coffeetree, tamarack (N), many poplar/cottonwood species (some N), swamp white oak (N), pin oak (N), many willow species (some N), many species of linden/basswood (some N); many species of elm (some N). Small flowering trees: many hawthorn species (some N), Japanese tree lilac. Evergreen shrubs: most juniper species (some N), white cedar (N). Deciduous shrubs: black chokeberry (N), red chokeberry, Siberian peashrub, tatarian dogwood, grey dogwood (N), red osier dogwood (N), diervilla (N), many forsythia species, winterberry (N), ninebark (N), potentilla (N), many species of sumac (some N), elderberry (N), many species of spirea, snowberry (N), common lilac, arrowwood viburnum (N), nannyberry viburnum (N), highbush cranberry viburnum (N). 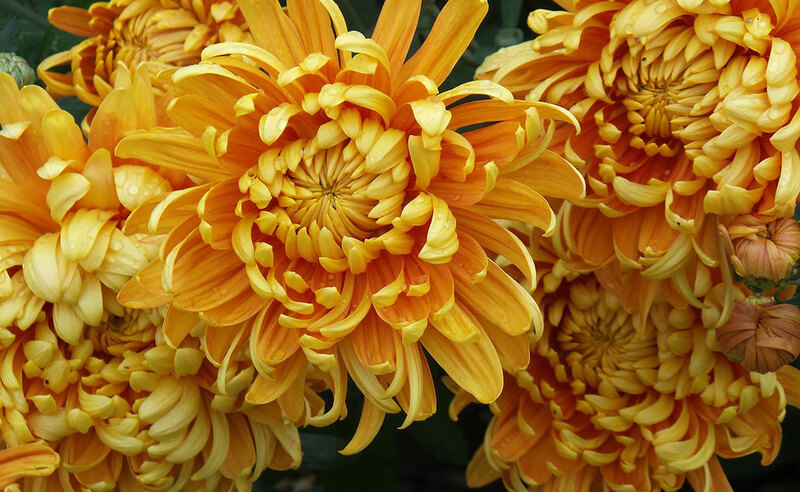 Once you’ve chosen a type of plant, obtain a young specimen rather than a very mature plant. Young specimens adapt more readily. Think of trees growing on ledges along hiking trails. A tree that starts life on site as a germinating seed is much more likely to adapt to the conditions than a mature plant transplanted into the site. Dig each planting hole slightly less deep than the root ball’s height, but as wide as possible. Measure the root ball’s height, and dig the hole so that the plant sits about one inch above grade, and rests on firm native soil rather than on backfill. If you find almost impenetrable hardpan soil when you dig the planting hole, and feel you must amend the soil in order to ensure the plant’s survival, then add not more than 25% well composted organic material by volume. Mix it well with the soil you removed, and backfill the planting hole with it. When you’ve finished, the top of the root ball should be at grade or even one inch above grade. This ensures that the roots that develop will be close to the soil surface, where there is sufficient oxygen in the pore spaces. Can I improve my lawn if it is growing in a clay soil? You can improve drainage and promote better grass growth in lawns over time. The process requires annual “core aeration” followed by adding organic matter. You can rent a core aerator from an equipment rental company. As you guide the machine over your lawn, it will remove 4- to 6-inch cores of soil, which will end up on the surface of the lawn. Rake the soil cores off the ground, and spread the area with 1-2 inches of screened organic matter (composted manure is best). Rake the organic matter evenly across the area. The raking process, combined with irrigation/rainfall afterward, helps move the organic matter into the core holes. It is not as effective as amending the entire soil bulk, but this process does help water and air enter the soil, and provides small vertical zones where roots can proliferate. Repeat this process annually to achieve a high quality lawn over time. What other techniques can help me develop a healthy landscape in clay soil? Don’t overwork the soil. 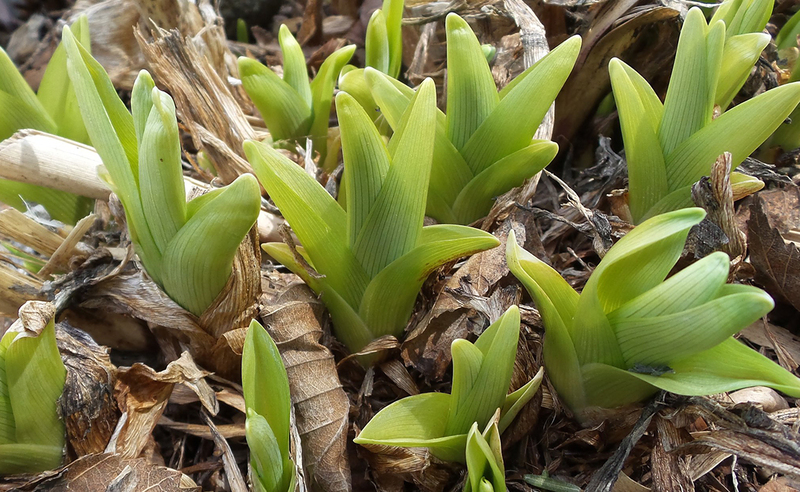 Once you’ve achieved good “soil clumps” in a clay soil, avoid disturbing it, as the process would break apart the clumps you worked so hard to achieve. When developing a new landscape area, such as a perennial garden or shrub border, improve the clay soil before planting. This process of incorporating organic matter (either compost or cover crop residue) may take a few years, but it is well worth the time and effort. When digging, use a garden fork rather than a shovel. It is less destructive of the clay clumps. Do not pulverize the soil with a rototiller or shovel. Work the soil when it’s moist enough to insert a garden fork, but not so wet as to stick to the fork tines. To grow plants that require better drainage, consider raised beds filled with loam. Build raised beds wide and deep enough to accommodate the plants’ entire root systems. Mulch the soil. Mulch slows the rain, giving it time to drain into the tiny pore spaces of clay. Mulch also prevents heavy rain from pulverizing the clay clumps at the soil surface, which makes water penetration even more difficult. When irrigating, use a drip system or a sprinkler that delivers water at a very slow rate. Slow water delivery allows time for the water to penetrate clay soil rather than running off. Many people, including gardeners, are raising poultry in their backyard for a fresh food source of eggs. Raising poultry can bring enjoyment but can also bring a few challenges and frustrations. A common question of many backyard poultry keepers is “Why are my hens not laying eggs regularly?” Hens can stop laying eggs or reduce their egg production for many reasons. A common reason for lack of egg production is lack of light. 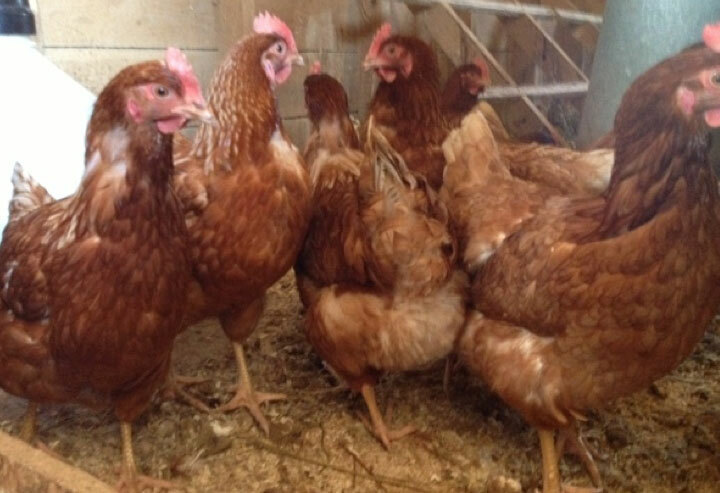 Hens are triggered to lay eggs by light (both quantity and quality). This being mid-summer, you have likely noticed that the day length has shortened. The hens are noticing this as well. 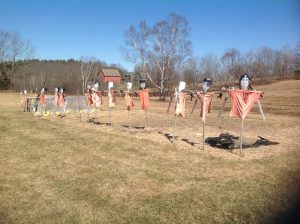 You can keep your hens laying more consistently by providing supplemental light. By providing a total of about 15 hours of light each day, your hens will continue to lay eggs on a fairly regular basis. This will happen if the hens are comfortable, get the proper nutrition, have access to fresh water and are not stressed. Calculate the length of day (duration of day light) by location by using a sunrise and sunset calculator. Karen Conlon’s house sits on a small rise surrounded by large trees. From the front porch, one barely glimpses the occasional passing car on the country road beyond. Birds are singing and leaves rustling. We’d never guess that we’re just a few miles from the hustle and bustle of downtown Brewer. Karen Conlon and her husband, ­­­­­­­­­­­­­Jim, are originally from Rhode Island. Karen grew up in a family where her parents always had a vegetable garden. In the summertime, meals were planned around what was ripe and ready to eat from the family plot. She remembers how she and her sister sometimes got in trouble when they ate fresh vegetables from the garden that had been earmarked for the evening meal! Early in their careers, Karen and Jim lived in Alaska where they started raising their family. Karen also took on the challenge of gardening in Zone 3! In 1990, career opportunities brought them to the Bangor/Brewer area. Karen tried her hand at vegetable gardening at her Brewer home but soon realized that her yard was too shady. Mature trees dominate the 2 ½ acre lot. One feels enveloped by the forest, enclosed and embraced by giants. Small swaths of lawn serve only to offset numerous garden beds and act as paths through the yard. As we round the house, we come upon the real treasure of this remarkable place. 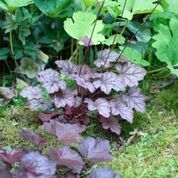 Tucked into the moss, we find miniature meadow rues (Thalictrum), ferns, Jack-in-the-pulpit (Arisaema), poppies (Papaver), bleeding heart (Dicentra syn Lamprocapnos), coral bells (Heuchera), and many varieties of hosta. Most of these plants have a fleeting bloom season so Karen focuses on colorful foliage and interesting texture. The beauty of this garden is proof that one need not have flowers. Mulched paths weave around the huge rocks. Native mosses and ferns flourish alongside introduced miniature woodland plants. Karen worked with what nature gave her. She grew exactly what the environment could support. 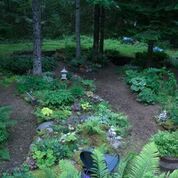 Karen’s rock garden in the woods reinforces the gardening rule, “Right plant, Right place.” She learned that achieving a natural, healthy balance in the landscape starts with evaluating your yard’s unique environment before planting. By doing so, you’re more likely to save money and avoid the disappointment of a plant that grows poorly or fails to thrive. Working with native plants has been a theme with Karen for years. She’s a Master Gardener Volunteer with Penobscot County and in that capacity, manages a native plant demonstration garden at Roger’s Farm in Stillwater. As of this writing, she was in the process of refurbishing her project at Roger’s Farm. When I visited her in Brewer, she showed me her propagation area where she has started many native plants from seed. Tables were filled with pots of virgin’s bower (Clematis virginiana), fireweed (Chamerion angustifolium), twin leaf (Jeffersonia diphylla), Allium, Echinacea and more. By late summer, they’ll be transplanted to her native plant demonstration garden. Karen’s parting words of advice were, “Make it simple. Don’t take on more than you can handle.” Karen has clearly followed her own advice. Growing native plants and working with her yard’s unique environment are a major part of her success. 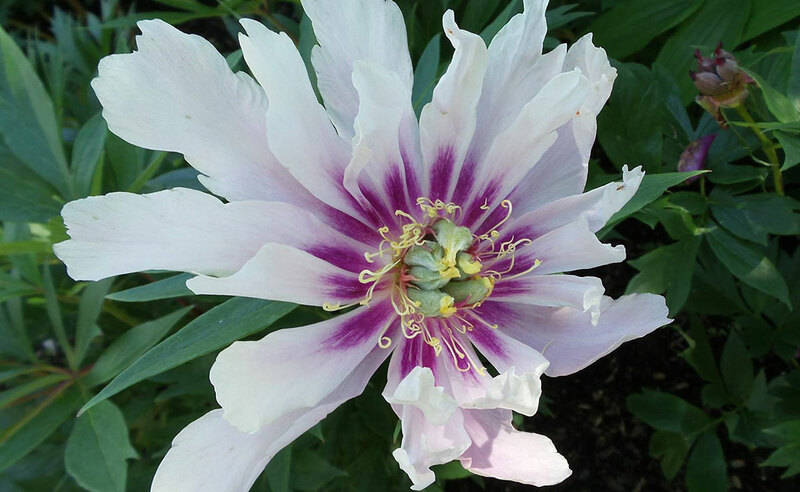 Lisa Colburn is a Master Gardener in Penobscot County, Maine and Sarasota County, Florida. 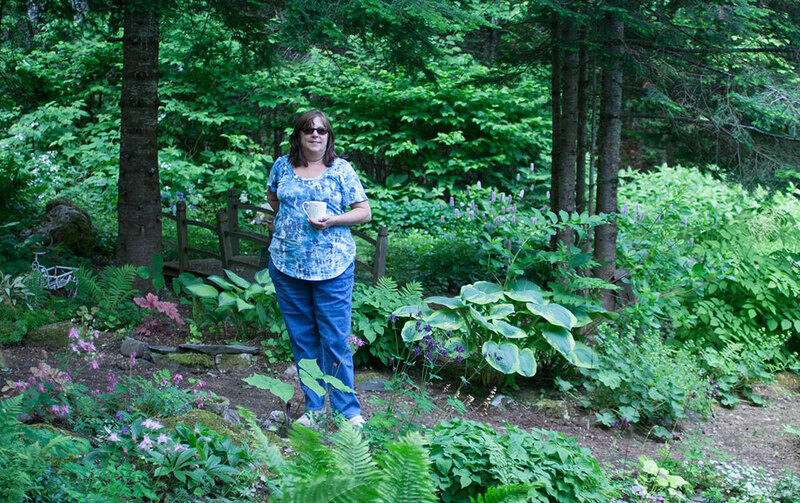 She is the author of The Maine Garden Journal — Insider secrets from Maine people who love to put their hands in the dirt. 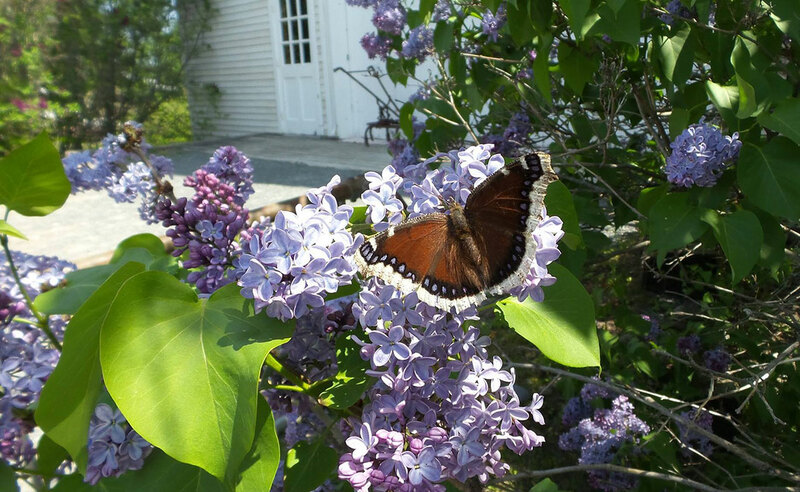 She will be writing a monthly article about Master Gardeners throughout Maine.